Light consisting of wavelengths 4000 A° & 6000 A° is incident on a double slit of separation 0.1mm kept at a distance of Im from a screen. A small rectangular photodetector, 2mm x 10 mm in size, of efficiency 20% and work function 2.2 eV is placed lengthwise. parallel to the fringes. The photoelectrons constituting the current are swept off and the photo current (ip) is allowed to pass through the circuit shown in the diagram. 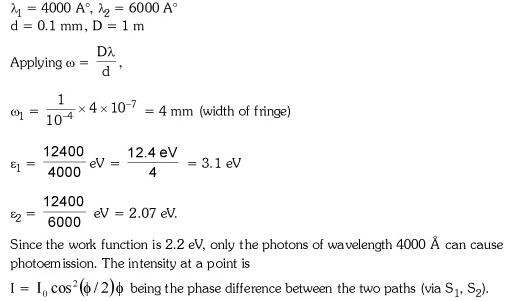 The photocurrent i$_p$,given that intensity of light at the maximum of the central fringe is 155W/m$^2$ due to each wavelength and the photodetector is placed at a position where the current i$_p$ is maximum. Assume that all photoelectrons have the same energy and that the extemal voltage is sufficient to sweep all the photoelectrons to form the current. We have to find the charge deposited on the capacitor C ( =120 u F) in 2 secs after the source of light (of both wavelengths) is switched on. Now how can I proceed. Unless I am mistaken, you have a solution, as in other questions. If you do not understand the solution given, please upload it and point out what difficulty you are having with it. I don't wish to reproduce solutions which you already have access to, but I don't mind trying to explain them. As with the other question, if you do not understand this topic you need to study it some more. But in this question , I have understood till the solution I have posted above. The solution tells you how to proceed. What exactly don't you understand about the next step? Sorry, the solution is not explained very well. For example $x$ and $\delta$ are not defined. At present I do not have the stamina to try to understand the solution given. I think I would need to solve the problem myself, but it is a very long question requiring several calculations in different topics (photo-electric effect, interference, RC circuits). I think I shall leave this question for someone else to tackle. I think I have got it a bit . If we are assuming the centre of detector as origin , then the x is the distance from it on the screen . And $\delta$ is the distance of detector from origin . And I am not getting how to write the circuits equation . If you don't wish to do it , you can leave it .